Chinese museum field is currently well-known for its vivid development and strong expansion. In addition to the huge number of new museums all around China, there is also a growing interest in capacity building and professional training. A new initiative was taken in 2018 to establish a training program addressing specifically to the needs of science centers and science museums. As a result, CIMUSET, Foundation for Development of Science and Technology Museums in China and China Science and Technology Museum (CSTM) in Beijing jointly organized the First International Training Workshop on Capacity Building for Science Centers and Museums in Beijing on October 29 th – November 4 th , 2018. Hosts and lecturers, from the left. Dep.Dir.Gen. Ou Jiancheng, Dr. Cheng Donghong, Mr. Yin Hao, Dr. Tilly Blyth, Mr. Eric Dimond, Ms. Carina Jaatinen, translator from the CSTM staff and Mr. Claude Faubert. Following the fact that exhibitions are one of the most important and most expensive products created by science centers and museums, as the Director General of the CSTM, Mr Yin Hao, stated in his opening speech, this first workshop was dedicated to the exhibition development with a title Developing Relevant and Inspiring Science Center Exhibitions. I had the honor to be one of the three international lecturers along with Dr. Tilly Blyth, Head of Collections at the London Science Museum, and Mr. Eric Dimond, Head of Exhibitions at the Exploratorium, San Francisco. Each of us delivered two half day sessions with some theory and a lot of practical hands-on excercises. Prototyping was an essential part of the program. Even if the program was tight and the days were long throughout the week, the spirit was high. I was enthusiastic to follow our more than 40 participants from Nepal, India, Iran, South Korea, China, New Zealand, Seychelles, South Africa, Brazil, Chile and Argentina, who threw themselves open-minded in team-building, ideating, prototyping and problem-solving. The CSTM, that is impressive both in size, content and visitor numbers (more than 4 million in 2018), provided us with an inspiring environment that we could fully use for the workshop purposes. Exhibitions in CSTM mix authentic objects, scenography, sensory elements and digital technology. New technologies, like face recognition, are presented through interactive exhibits. AI is represented by a multitasking game robot. As always, when you teach, you learn yourself too, and for me this workshop was a major learning opportunity. Exchanges with the other lecturers and participants gave me again new insight in the methodology of exhibition development. I am also continuously fascinated about the overwhelming richness of Chinese culture and the open friendliness of Chinese people. I remain most grateful to the organizers and to Mr. Claude Faubert, the coordinator of the workshop, who invited me to be part of this experience. Mr. Ou Jiancheng from the Chinese Association of National Science Museums presents future plans for development of science centers and museums in the context of the Belt and Road Initiative. China´s museum scene is worth to be constantly followed due to its rapid change and development. New horizons are currently opening up among others through the new initiative for strengthening science communication and cooperation among natural science museums involved in the Belt and Road Initiative, led by the China Science and Technology Museum. 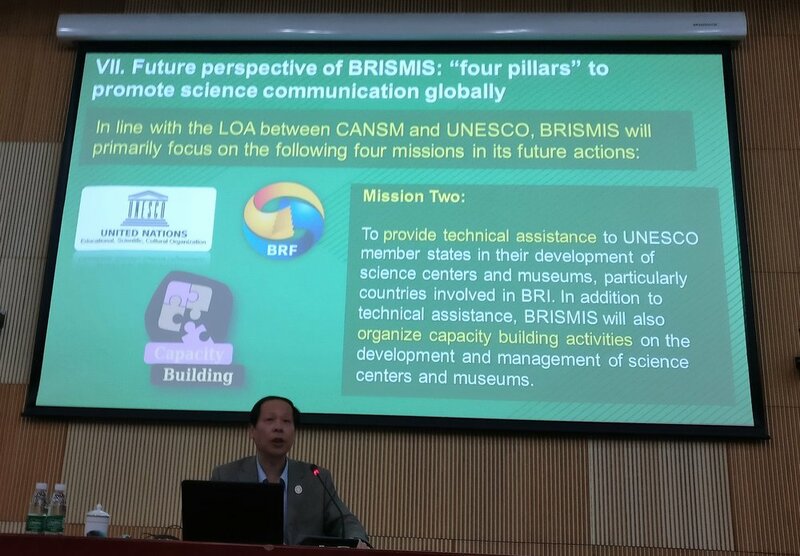 I recommend reading more about BRISMIS and the Beijing Declaration, supported by UNESCO, which not only highlights the unique role of science-related museums in supporting the realization of the Sustainable Development Goals of the United Nations, but also proposes concrete actions in strengthening their role in societies. Happy participants with their certificates after one week workshop.